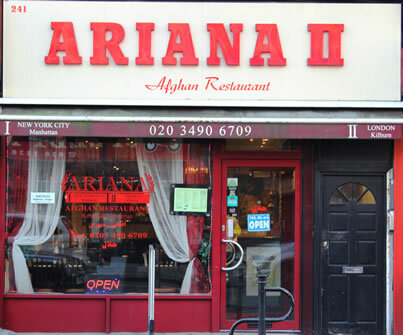 The first Ariana Afghan Restaurant was established 1986 in Manhattan, New York. With the success of the first branch the family thought of opening a second branch in London as a large group of the family resided here. We stumbled upon Kilburn High Road and hence Ariana 2 was established (2010). Afghanistan has a rich cultural heritage going back more than 5,000 years. Afghanistan's ethnically and linguistically diverse population is a reflection of its geographic location where the renowned trade route, the Silk Road, passes through. This historical trade route has linked traders, merchants, pilgrims, monks, soldiers, nomads, and urban dwellers from all over the Asian continent and has had a direct influence on the flavours of Afghan cuisine. Ariana II Afghan Restaurant offers a full array of titillating Afghan dishes for your dining pleasure at our restaurant in Kilburn, London. Enjoy the mysteries of Afghanistan's delicately delicious dumplings topped with natural yoghurt and mild ground meat sauce. Savour our Afghan style kebabs, marinated with herbs and spices, broiled with fresh onions and peppers, and served with rice and your choice of salad. Choose from a large selection of Vegetarian dishes, all cooked with fresh sauces and herbs, served with brown basmati rice and salad. Don't forget to save room for Dessert! Delight in a serving of Firnee, a silky pudding sprinkled with pistachios and almonds. Or how about a tender sweet slice of baklava finished off with our “Happy tea” (cardamom tea). At Ariana Afghan restaurant, a family owned restaurant since 1986, pleasant surprises await you. 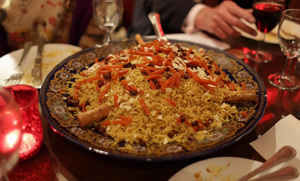 Discover the tastes of traditional Afghan cuisine. Our menu ranges from delicious starters and main courses to delectable desserts. Ariana II menus are available to view online and download (PDF). 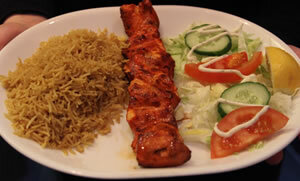 Kabuli palow, chicken kebab comes with 2 starters, drinks and dessert. Starter Around the table, Kabuli palow, chicken kebab, mantu and kofta kebab, drinks and desserts.